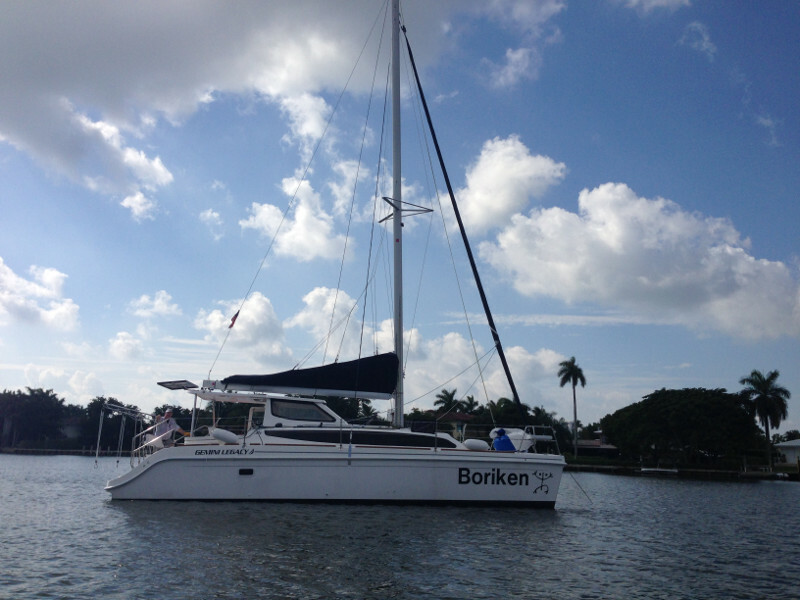 This 2016 Gemini Legacy 35 catamaran for sale just keeps getting better! Fully equipped with all the creature comforts, this Gem is ready for long weekend cruises, extended travel plans or your permanent floating home. Custom options include a drop down box from the ceiling of the cockpit to store your favorite brand HDTV, upgrade to ultra-leather cushions to ensure a comfy seat while enjoying a meal or getting caught up on the daily news, hatch blinds keep the cabin cool on sunny days and the convenience of a microwave oven means you will not be wasting precious time cooking when you would rather be sailing! The Electric Anchor Windlass on this 2016 Gemini Legacy 35 makes anchoring a breeze! Simply press a button, lower your dinghy from the stainless steel dingy davits and you’re off on an adventure! And do not worry about your refrigeration while you’ve gone exploring as the solar panels will bring in any extra energy you need to supplement the Group 31 batteries. A larger holding tank for fresh water or longer distance travel and a full suite of Raymarine instrumentation rounds out the package. This Gem is ready to go … a true Gem for all reasons … Day Trip, Weekend Cruiser, Long Term Travel or Live-Aboard … she does it all! 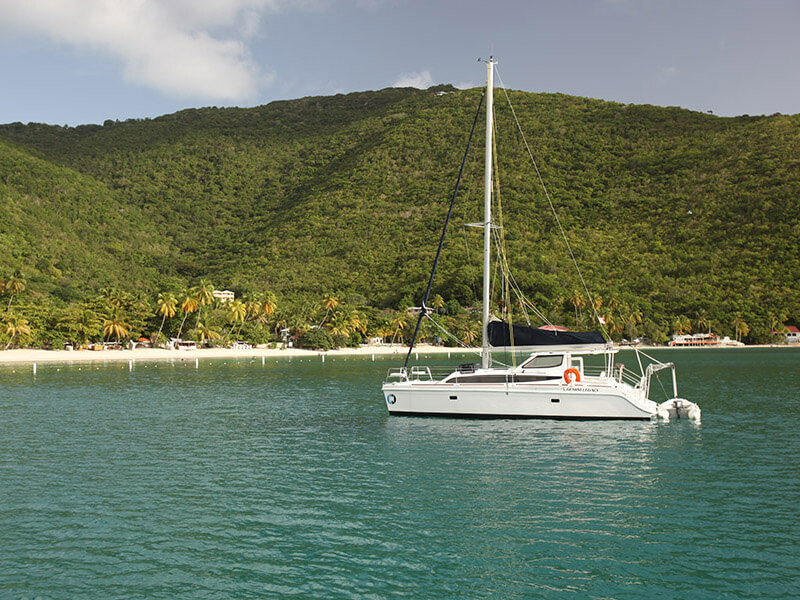 Made in America since 1981, the Gemini Legacy has proven to be the most family-friendly performance cruising catamaran in the world. Designed and built in the USA, the Gemini 35 looks nothing like competition. 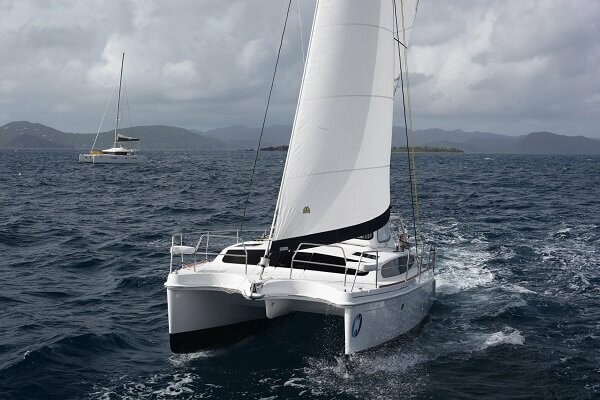 This catamaran allows you to dock anywhere in the world with its length of 35 ft and beam of 14 ft. Gemini was designed for comfort onboard. Compared to other catamarans, the large indoor seating area is symmetrical, offering a view on each side of the vessel, and the two hulls are far more open to the center of the vessel than the classic catamaran. This boat is a 3 cabins 1 head layout. 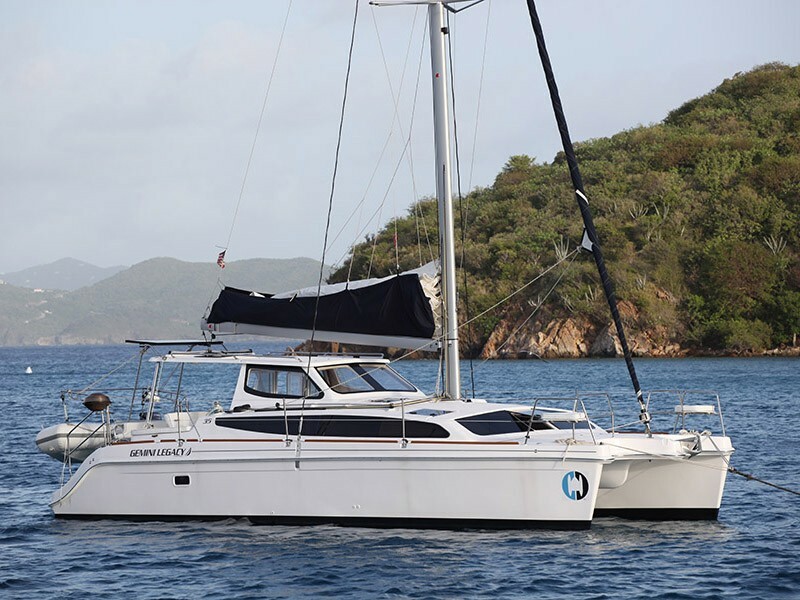 The Gemini Legacy 35x has an extended transom that has made the annoyances associated with boarding an aft a much more convenient process, not to mention the additional space to utilize the sugar scoops for jumping off into the Caribbean Sea! 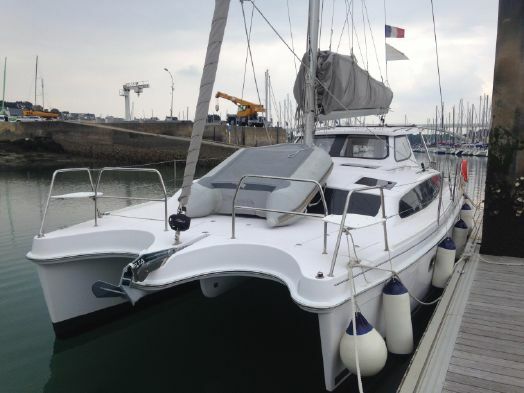 Debi Doll II is a performance cruising catamaran that is equipped with the X extensions which has improved sailability, simplified the loading and unloading process, as well as provide enough room for a diving platform for the family and friends. 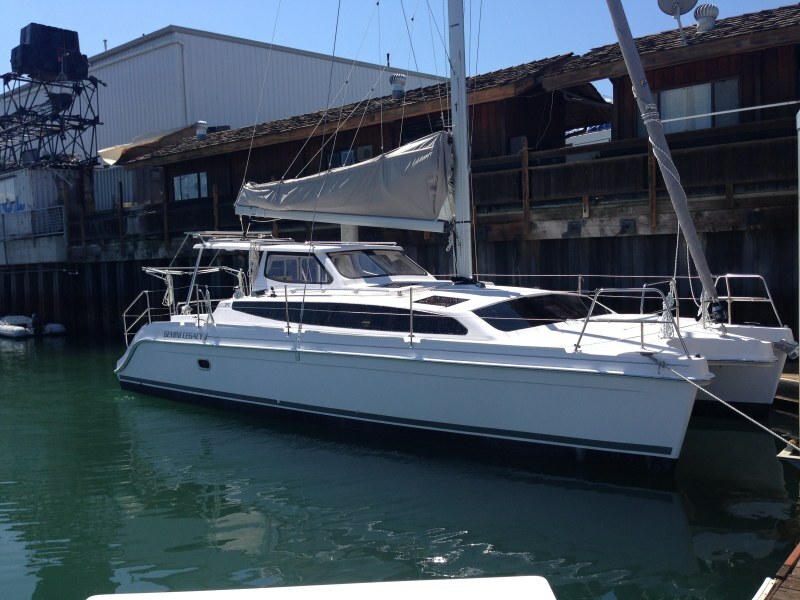 2015 Catalina built Gemini Legacy 35 catamaran for sale. 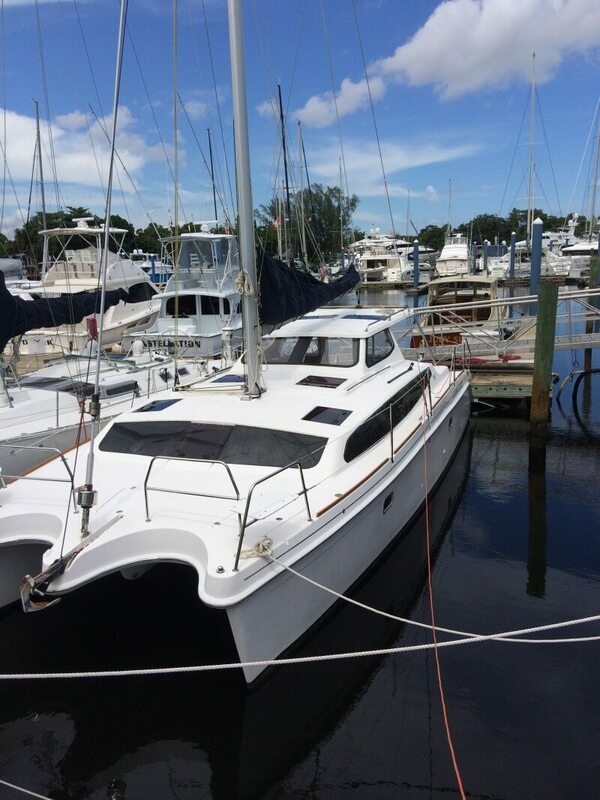 This Gem comes complete with all the new 2015 features including upgraded owner head with vessel sink, wall shower, linen closet, Corian seat and teak grating.